Permission to use, copy and distribute this documentation without modification, for any purpose and without fee or royalty is hereby granted, provided that both the above copyright notice and this permission notice appears in all copies and that the name of OpenSS7 Corporation not be used in advertising or publicity pertaining to distribution of this documentation or its contents without specific, written prior permission. OpenSS7 Corporation makes no representation about the suitability of this documentation for any purpose. It is provided “as is” without express or implied warranty. OpenSS7 Corporation disclaims all warranties with regard to this documentation including all implied warranties of merchantability, fitness for a particular purpose, non-infringement, or title; that the contents of the document are suitable for any purpose, or that the implementation of such contents will not infringe on any third party patents, copyrights, trademarks or other rights. In no event shall OpenSS7 Corporation be liable for any direct, indirect, special or consequential damages or any damages whatsoever resulting from loss of use, data or profits, whether in an action of contract, negligence or other tortious action, arising out of or in connection with any use of this document or the performance or implementation of the contents thereof. OpenSS7 Corporation is making this documentation available as a reference point for the industry. While OpenSS7 Corporation believes that these interfaces are well defined in this release of the document, minor changes may be made prior to products conforming to the interfaces being made available. This document is a Specification containing technical details concerning the implementation of the Signalling Data Link Interface (SDLI) for OpenSS7. It contains recommendations on software architecture as well as platform and system applicability of the Signalling Data Link Interface (SDLI). This document specifies a Signalling Data Link Interface (SDLI) Specification in support of the OpenSS7 Signalling Data Link (SDL) protocol stacks. It provides abstraction of the signalling data link interface to these components as well as providing a basis for signalling data link control for other data link control protocols. The purpose of this document is to provide technical documentation of the Signalling Data Link Interface (SDLI). This document is intended to be included with the OpenSS7 STREAMS software package released by OpenSS7 Corporation . It is intended to assist software developers, maintainers and users of the Signalling Data Link Interface (SDLI) with understanding the software architecture and technical interfaces that are made available in the software package. It is the intent of this document that it act as the primary source of information concerning the Signalling Data Link Interface (SDLI). This document is intended to provide information for writers of OpenSS7 Signalling Data Link Interface (SDLI) applications as well as writers of OpenSS7 Signalling Data Link Interface (SDLI) Users. The audience for this document is software developers, maintainers and users and integrators of the Signalling Data Link Interface (SDLI). The target audience is developers and users of the OpenSS7 SS7 stack. Although the author has attempted to ensure that the information in this document is complete and correct, neither the Author nor OpenSS7 Corporation will take any responsibility in it. Take care that you are working with a current version of this documentation: you will not be notified of updates. To ensure that you are working with a current version, check the OpenSS7 Project website for a current version. Only the texinfo or roff source is controlled. A printed (or postscript) version of this document is an UNCONTROLLED VERSION. This document specifies a STREAMS -based kernel-level instantiation of the ITU-T Signalling Data Link Interface (SDLI) definition. The Signalling Data Link Interface (SDLI) enables the user of a a signalling data link service to access and use any of a variety of conforming signalling data link providers without specific knowledge of the provider's protocol. The service interface is designed to support any network signalling data link protocol and user signalling data link protocol. This interface only specifies access to signalling data link service providers, and does not address issues concerning signalling data link management, protocol performance, and performance analysis tools. This specification assumes that the reader is familiar with ITU-T state machines and signalling data link interfaces (e.g. Q.703, Q.2210), and STREAMS . This document specifies an interface that supports the services provided by the Signalling System No. 7 (SS7) for ITU-T, ANSI and ETSI applications as described in ITU-T Recommendation Q.703, ITU-T Recommendation Q.2210, ANSI T1.111.3, ETSI ETS 300 008-1. These specifications are targeted for use by developers and testers of protocol modules that require signalling data link service. A user of Local Management Services. A provider of Local Management Services. A SDL-User that initiates a Signalling Data Link. A SDL-User with whom an originating SDL user wishes to establish a Signalling Data Link. Kernel level protocol or user level application that is accessing the services of the Signalling Data Link sub-layer. Signalling Data Link sub-layer entity/entities that provide/s the services of the Signalling Data Link interface. A communication services development facility first available with UNIX System V Release 3. The Signalling Data Link Layer provides the means to manage the association of SDL-Users into connections. It is responsible for the routing and management of data to and from signalling data link connections between SDL-user entities. The SDLI defines the services provided by the signalling data link layer to the signalling data link user at the boundary between the signalling data link provider and the signalling data link user entity. The interface consists of a set of primitives defined as STREAMS messages that provide access to the signalling data link layer services, and are transferred between the SDLS user entity and the SDLS provider. These primitives are of two types; ones that originate from the SDLS user, and other that originate from the SDLS provider. The primitives that originate from the SDLS user make requests to the SDLS provider, or respond to an indication of an event of the SDLS provider. The primitives that originate from the SDLS provider are either confirmations of a request or are indications to the CCS user that an event has occurred. Figure 1 shows the model of the SDLI. The SDLI allows the SDLS provider to be configured with any signalling data link layer user (such as a signalling data terminal application) that also conforms to the SDLI. A signalling data link layer user can also be a user program that conforms to the SDLI and accesses the SDLS provider via putmsg(2s) and getmsg(2s) system calls. The typical configuration, however, is to place a signalling data terminal module above the signalling data link layer. The features of the SDLI are defined in terms of the services provided by the SDLS provider, and the individual primitives that may flow between the SDLS user and the SDLS provider. The SDLI Services are broken into two groups: local management services and protocol services. Local management services are responsible for the local management of streams, assignment of streams to physical points of attachment, enabling and disabling of streams, management of options associated with a stream, and general acknowledgement and event reporting for the stream. Protocol services consist of connecting a stream to a medium, exchanging bits with the medium, and disconnecting the stream from the medium. Local management services are listed in Table 1. The local management services interface is described in Local Management Services, and the primitives are detailed in Local Management Service Primitives. The local management services interface is defined by the ss7/lmi.h header file (see LMI Header File Listing). Protocol services are listed in Table 2. The protocol services interface is described in Protocol Services, and the primitives are detailed in Protocol Service Primitives. The protocol services interface is defined by the ss7/sdli.h header file (see SDLI Header File Listing). The SDLI is typically implemented as a device driver controlling a TDM (Time Division Multiplexing) device that provides access to channels. The purpose behind exposing this low level interface is that almost all communications channel devices can be placed into a raw mode, where a bit stream can be exchanged between the driver and the medium. The SDLI provides a interface that, once implemented as a driver for a new device, can provide complete and verified SS7 signalling link capabilities by pushing generic SDT (Signalling Data Terminal) and SL (Signalling Link) modules over an open device stream. This allows SDT and SL modules to be verified independently for correct operation and then simply used for all manner of new device drivers that can implement the SDLI interface. The acknowledgement service provides the LMS user with the ability to receive positive and negative acknowledgements regarding the successful or unsuccessful completion of services. LMI_OK_ACK: The LMI_OK_ACK message is used by the LMS provider to indicate successful receipt and completion of a service primitive request that requires positive acknowledgement. LMI_ERROR_ACK: The LMI_ERROR_ACK message is used by the LMS provider to indicate successful receipt and failure to complete a service primitive request that requires negative acknowledgement. A successful invocation of the acknowledgement service is illustrated in Figure 15. As illustrated in Figure 15, the service primitives for which a positive acknowledgement may be returned are the LMI_ATTACH_REQ and LMI_DETACH_REQ. An unsuccessful invocation of the acknowledgement service is illustrated in Figure 16. As illustrated in Figure 16, the service primitives for which a negative acknowledgement may be returned are the LMI_INFO_REQ, LMI_ATTACH_REQ, LMI_DETACH_REQ, LMI_ENABLE_REQ, LMI_DISABLE_REQ and LMI_OPTMGMT_REQ messages. The information reporting service provides the LMS user with the ability to elicit information from the LMS provider. LMI_INFO_REQ: The LMI_INFO_REQ message is used by the LMS user to request information about the LMS provider. LMI_INFO_ACK: The LMI_INFO_ACK message is issued by the LMS provider to provide requested information about the LMS provider. A successful invocation of the information reporting service is illustrated in Figure 2. A Style 1 LMS provider is a provider that associates a stream with a PPA at the time of the first open(2) call for the device, and disassociates a stream from a PPA at the time of the last close(2) call for the device. Physical points of attachment (PPA) are assigned to major and minor device number combinations. When the major and minor device number combination is opened, the opened stream is automatically associated with the PPA for the major and minor device number combination. The last close of the device disassociates the PPA from the stream. Freshly opened Style 1 LMS provider streams start life in the LMI_DISABLED state. This approach is suitable for LMS providers implemented as real or pseudo-device drivers and is applicable when the number of minor devices is small and static. A Style 2 LMS provider is a provider that associates a stream with a PPA at the time that the LMS user issues the LMI_ATTACH_REQ message. Freshly opened streams are not associated with any PPA. The Style 2 LMS provider stream is disassociated from a PPA when the stream is closed or when the LMS user issues the LMI_DETACH_REQ message. Freshly opened Style 2 LMS provider streams start life in the LMI_UNATTACHED state. This approach is suitable for LMS providers implemented as clone real or pseudo-device drivers and is applicable when the number of minor devices is large or dynamic. The PPA attachment service provides the LMS user with the ability to attach a Style 2 LMS provider stream to a physical point of appearance (PPA). LMI_ATTACH_REQ: The LMI_ATTACH_REQ message is issued by the LMS user to request that a Style 2 LMS provider stream be attached to a specified physical point of appearance (PPA). LMI_OK_ACK: Upon successful receipt and processing of the LMI_ATTACH_REQ message, the LMS provider acknowledges the success of the service completion with a LMI_OK_ACK message. LMI_ERROR_ACK: Upon successful receipt but failure to process the LMI_ATTACH_REQ message, the LMS provider acknowledges the failure of the service completion with a LMI_ERROR_ACK message. A successful invocation of the attachment service is illustrated in Figure 3. The PPA detachment service provides the LMS user with the ability to detach a Style 2 LMS provider stream from a physical point of attachment (PPA). LMI_DETACH_REQ: The LMI_DETACH_REQ message is issued by the LMS user to request that a Style 2 LMS provider stream be detached from the attached physical point of appearance (PPA). LMI_OK_ACK: Upon successful receipt and processing of the LMI_DETACH_REQ message, the LMS provider acknowledges the success of the service completion with a LMI_OK_ACK message. LMI_ERROR_ACK: Upon successful receipt but failure to process the LMI_DETACH_REQ message, the LMS provider acknowledges the failure of the service completion with a LMI_ERROR_ACK message. A successful invocation of the detachment service is illustrated in Figure 4. The initialization service provides the LMS user with the abilty to enable and disable the stream for the associated PPA. The interface enable service provides the LMS user with the ability to enable an LMS provider stream that is associated with a PPA. Enabling the interface permits the LMS user to exchange protocol service interface messages with the LMS provider. LMI_ENABLE_REQ: The LMI_ENABLE_REQ message is issued by the LMS user to request that the protocol service interface be enabled. LMI_ENABLE_CON: Upon successful enabling of the protocol service interface, the LMS provider acknowledges successful completion of the service by issuing a LMI_ENABLE_CON message to the LMS user. LMI_ERRORK_ACK: Upon unsuccessful enabling of the protocol service interface, the LMS provider acknowledges the failure to complete the service by issuing an LMI_ERROR_ACK message to the LMS user. A successful invocation of the enable service is illustrated in Figure 5. The interface disable service provides the LMS user with the ability to disable an LMS provider stream that is associated with a PPA. Disabling the interface withdraws the LMS user's ability to exchange protocol service interface messages with the LMS provider. LMI_DISABLE_REQ: The LMI_DISABLE_REQ message is issued by the LMS user to request that the protocol service interface be disabled. LMI_DISABLE_CON: Upon successful disabling of the protocol service interface, the LMS provider acknowledges successful completion of the service by issuing a LMI_DISABLE_CON message to the LMS user. LMI_ERRORK_ACK: Upon unsuccessful disabling of the protocol service interface, the LMS provider acknowledges the failure to complete the service by issuing an LMI_ERROR_ACK message to the LMS user. A successful invocation of the disable service is illustrated in Figure 6. The options management service provides the LMS user with the ability to control and affect various generic and provider-specific options associated with the LMS provider. LMI_OPTMGMT_REQ: The LMS user issues a LMI_OPTMGMT_REQ message when it wishes to interrogate or affect the setting of various generic or provider-specific options associated with the LMS provider for the stream upon which the message is issued. LMI_OPTMGMT_ACK: Upon successful receipt of the LMI_OPTMGMT_REQ message, and successful options processing, the LMS provider acknowledges the successful completion of the service with an LMI_OPTMGMT_ACK message. LMI_ERROR_ACK: Upon successful receipt of the LMI_OPTMGMT_REQ message, and unsuccessful options processing, the LMS provider acknowledges the failure to complete the service by issuing an LMI_ERROR_ACK message to the LMS user. A successful invocation of the options management service is illustrated in Figure 7. The error reporting service provides the LMS provider with the ability to indicate asynchronous errors to the LMS user. LMI_ERROR_IND: The LMS provider issues the LMI_ERROR_IND message to the LMS user when it needs to indicate an asynchronous error (such as the unusability of the communications medium). A successful invocation of the error reporting service is illustrated in Figure 8. A successful invocation of the statistics reporting service is illustrated in Figure 9. The event reporting service provides the LMS provider with the ability to indicate specific asynchronous management events to the LMS user. LMI_EVENT_IND: The LMS provider issues the LMI_EVENT_IND message to the LMS user when it wishes to indicate an asynchronous (management) event to the LMS user. A successful invocation of the event reporting service is illustrated in Figure 10. Protocol services are specific to the Signalling Data Link interface. These services consist of connection services that permit the transmit and receive directions to be connected to or disconnected from the medium, and data transfer services that permit the exchange of bits between SDLS users. The service primitives that implement the protocol services are described in detail in Protocol Service Primitives. The connection service provides the ability for the SDLS user to connect to the medium for the purpose of transmitting bits, receiving bits, or both. In SS7, this is a Level 1 function, possibly the responsibility of multiplex or digital cross-connect switch. SDL_CONNECT_REQ: The SDL_CONNECT_REQ message is used by the SDLS user to request that the stream be connected to the medium. Connection to the medium might require some switching or other mechanism to prepare the stream for data transmission and receiption. Connections can be formed for the receive direction or the transmit direction independently. A successful invocation of the connection service is illustrated in Figure 11. The data transfer service provides the SDLS user with the ability to request that bits be transmitted on the medium, and the SDLS provider with the ability to indicate bits that have been received from the medium. SDL_BITS_FOR_TRANSMISSION_REQ: The SDL_BITS_FOR_TRANSMISSION_REQ message is used by the SDLS user to place raw bits onto the medium. The stream must have first been successfully activated in the transmit direction using the SDL_CONNECT_REQ message. SDL_RECEIVED_BITS_IND: The SDL_RECEIVED_BITS_IND message is issued by the SDLS provider when activated for the receive direction with the SDL_CONNECT_REQ message, to indicate bits received on the medium. A successful invocation of the data transfer service is illustrated in Figure 12. The disconnection service provides the ability for the SDLS user to disconnect from the medium, withdrawing from the purpose of transmitting bits, receiving bits, or both. It allow allows the SDLS provider to autonomously indicate that the medium has been disconnected from the stream. In SS7, this is a Level 1 function, possible the responsibility of a multiplex or digital cross-connect switch. SDL_DISCONNECT_REQ: The SDL_DISCONNECT_REQ message is used by the SDLS user to request that the stream be disconnected from the medium. Disconnection from the medium might require some switching or other mechanism. Disconnection can be perofrmed for the receive direction or the transmit direction independently. SDL_DISCONNECT_IND: The SDL_DISCONNECT_IND message is used by the SDLS provider to indicate to the SDLS user that the stream has been disconnected from the medium. Disconnection is indicated for both the receive and transmit directions. A successful invocation of the disconnection service by the SDLS user is illustrated in Figure 13. A successful invocation of the disconnection service by the SDLS provider is illustrated in Figure 14. These service primitives implement the local management services (see Local Management Services). These service primitives implement the acknowledgement service (see Acknowledgement Service). This primitive is used to acknowledge receipt and successful service completion for primitives requiring acknowledgement that have no confirmation primitive. Indicates the service primitive type. Always LMI_OK_ACK. No PPA attached, awaiting LMI_ATTACH_REQ. Device cannot be used, STREAM in hung state. Ready for use, awaiting primitive exchange. This primitive is issued by the LMS provider in the LMI_ATTACH_PENDING or LMI_DETACH_PENDING state. The new state is LMI_UNATTACHED or LMI_DISABLED, depending on thee primitive to which the message is responding. The error acknowledgement primitive is used to acknowledge receipt and unsuccessful service completion for primitives requiring acknowledgement. Indicates the primitive type. Always LMI_ERROR_ACK. Primitive was issued from invalid state. HDLC link no longer idle. Start of device-specific error codes. Indicates the reason for failure. This field is protocol-specific. When the lmi_errno field is LMI_SYSERR, the lmi_reason field is the UNIX error number as described in errno(3). This primitive can be issued in any state for which a local acknowledgement is not pending. The LMS provider state at the time that the primitive was issued is indicated in the primitive. These service primitives implement the information reporting service (see Information Reporting Service). This LMS user originated primitive is issued by the LMS user to request that the LMS provider return information concerning the capabilities and state of the LMS provider. Specifies the primitive type. Always LMI_INFO_REQ. This primitive may be issued in any state but only when a local acknowledgement is not pending. Successful: The LMS provider is required to acknowledge receipt of the primitive and provide the requested information using the LMI_INFO_ACK primitive. Unsuccessful (non-fatal errors): The LMS provider is required to negatively acknowledge the primitive using the LMI_ERROR_ACK primitive, and include the reason for failure in the primitive. This LMS provider originated primitive acknowledges receipt and successful processing of the LMI_INFO_REQ primitive and provides the request information concerning the LMS provider. Indicates the service primitive type. Always LMI_INFO_ACK. Indicates the version of this specification that is being used by the LMS provider. Indicates the maximum size of a Service Data Unit. Indicates the minimum size of a Service Data Unit. Indicates the amount of header space that should be reserved for placing LMS provider headers. PPA is implicitly attached by open(2). PPA must be explicitly attached using LMI_ATTACH_REQ. This is a variable length field. The length of the field is determined by the length of the M_PROTO or M_PCPROTO message block. For a Style 2 driver, when lmi_ppa_style is LMI_STYLE2, and when in an attached state, this field providers the current PPA associated with the stream; the length is typically 4 bytes. For a Style 1 driver, when lmi_ppa_style is LMI_STYLE1, the length it 0 bytes. This primitive can be issued in any state where a local acknowledgement is not pending. These service primitives implement the physical point of attachment service (see Physical Point of Attachment Service). This LMS user originated primitive requests that the stream upon which the primitive is issued by associated with the specified Physical Point of Attachment (PPA). This primitive is only applicable to Style 2 LMS provider streams, that is, streams that return LMI_STYLE2 in the lmi_ppa_style field of the LMI_INFO_ACK. Specifies the service primitive type. Always LMI_ATTACH_REQ. Specifies the Physical Point of Attachment (PPA) to which to associated the Style 2 stream. This is a variable length identifier whose length is determined by the length of the M_PROTO message block. This primitive is only valid in state LMI_UNATTACHED and when a local acknowledgement is not pending. Upon success, the new state is LMI_ATTACH_PENDING. Upon failure, the state remains unchanged. Successful: The LMS provider acknowledges receipt of the primitive and successful outcome of the attach service with a LMI_OK_ACK primitive. The new state is LMI_DISABLED. Unsuccessful (non-fatal errors): The LMS provider acknowledges receipt of the primitive and failure of the attach service with a LMI_ERROR_ACK primitive containing the reason for failure. The new state remains unchanged. This LMS user originated primitive request that the stream upon which the primitive is issued be disassociated from the Physical Point of Appearance (PPA) to which it is currently attached. This primitive is only applicable to Style 2 LMS provider streams, that is, streams that return LMI_STYLE2 in the lmi_ppa_style field of the LMI_INFO_ACK. Specifies the service primitive type. Always LMI_DETACH_REQ. This primitive is valid in the LMI_DISABLED state and when no local acknowledgement is pending. Upon success, the new state is LMI_DETACH_PENDING. Upon failure, the state remains unchanged. Successful: The LMS provider acknowledges receipt of the primitive and successful outcome of the detach service with a LMI_OK_ACK primitive. The new state is LMI_UNATTACHED. Unsuccessful (non-fatal errors): The LMS provider acknowledges receipt of the primitive and failure of the detach service with a LMI_ERROR_ACK primitive containing the reason for failure. The new state remains unchanged. Initialization service primitives allow the LMS user to enable or disable the protocol service interface. Enabling the protocol service interface may require that some action be taken to prepare the protocol service interface for use or to remove it from use. For example, where the PPA corresponds to a signalling data link identifier as defined in Q.704, it may be necessary to perform switching to connect or disconnect the circuit identification code associated with the signalling data link identifier. These service primitives implement the initialization service (see Initialization Service). This LMS user originated primitive request that the LMS provider perform the actions necessary to enable the protocol service interface and confirm that it is enabled. This primitive is applicable to both styles of PPA. Specifies the service primitive type. Always LMI_ENABLE_REQ. Specifies a remote address to which to connect the PPA. The need for and form of this address is provider-specific. The length of the field is determined by the length of the M_PROTO message block. This remote address could be a circuit identification code, an IP address, or some other form of circuit or channel identifier. Upon success the new state is LMI_ENABLE_PENDING. Upon failure, the state remains unchanged. Successful: When successful, the LMS provider acknowledges successful completion of the enable service with an LMI_ENABLE_CON primitive. The new state is LMI_ENABLED. Unsuccessful (non-fatal errors): When unsuccessful, the LMS provider acknowledges the failure of the enable service wtih an LMI_ERROR_ACK primitive containing the error. The new state remains unchanged. This LMS provider originated primitive is issued by the LMS provider to confirm the successful completion of the enable service. Indicates the service primitive type. Always LMI_ENABLE_CON. This primitive is issued by the LMS provider in the LMI_ENABLE_PENDING state. The new state is LMI_ENABLED. This LMS user originated primitive requests that the LMS provider perform the actions necessary to disable the protocol service interface and confirm that it is disabled. The primitive is applicable to both styles of PPA. Specifies the service primitive type. Always LMI_DISABLE_REQ. The disable request service primitive is valid in the LMI_ENABLED state and when no local acknowledgement is pending. Upon success, the new state is LMI_DISABLE_PENDING. Upon failure, the state remains unchanged. Successful: When successful, the LMS provider acknowledges successful completion of the disable service with an LMI_DISABLE_CON primitive. The new state is LMI_DISABLED. Unsuccessful (non-fatal errors): When unsuccessful, the LMS provider acknowledges the failure of the disable service with an LMI_ERROR_ACK primitive containing the error. The new state remains unchanged. This LMS provider originated primitive is issued by the LMS provider to confirm the successful completion of the disable service. Indicates the service primitive type. Always LMI_DISABLE_CON. This primitive is issued by the LMS provider in the LMI_DISABLE_PENDING state. The new state is LMI_DISABLED. The options management service primitives allow the LMS user to negotiate options with the LMS provider, retrieve the current and default values of options, and check that values specified for options are correct. The options management service primitive implement the options management service (see Options Management Service). This LMS user originated primitive requests that LMS provider options be managed. Specifies the service primitive type. Always LMI_OPTMGMT_REQ. Specifies the length of the options. Specifies the offset, from the beginning of the M_PROTO message block, of the start of the options. Negotiate the specified value of each specified option and return the negotiated value. Check the validity of the specified value of each specified option and return the result. Do not alter the current value assumed by the LMS provider. Return the default value for the specified options (or all options). Do not alter the current value assumed by the LMS provider. Return the current value for the specified options (or all options). Do not alter the current value assumed by the LMS provider. Successful: Upon success, the LMS provider acknowledges receipt of the service primitive and successful completion of the options management service with an LMI_OPTMGMT_ACK primitive containing the options management result. The state remains unchanged. Unsuccessful (non-fatal errors): Upon failure, the LMS provider acknowledges receipt of the service primitive and failure to complete the options management service with an LMI_ERROR_ACK primitive containing the error. The state remains unchanged. This LMS provider originated primitive is issued by the LMS provider upon successful completion of the options management service. It indicates the outcome of the options management operation requested by the LMS user in a LMI_OPTMGMT_REQ primitive. Indicates the service primitive type. Always LMI_OPTMGMT_ACK. Indicates the length of the returned options. Indicates the offset of the returned options from the start of the M_PCPROTO message block. The LMS provider succeeded in negotiating or returning all of the options specified by the LMS user in the LMI_OPTMGMT_REQ primitive. The LMS provider failed to negotiate one or more of the options specified by the LMS user. The LMS provider negotiated a value of lower quality for one or more of the options specified by the LMS user. The LMS provider failed to negotiate one ore more of the options specified by the LMS user because the option is treated as read-only by the LMS provider. The LMS provider failed to recognize one or more of the options specified by the LMS user. This primitive is issued by the LMS provider in direct response to an LMI_OPTMGMT_REQ primitive. When the lmi_mgmt_flags field in the LMI_OPTMGMT_REQ primitive is set to LMI_NEGOTIATE, the LMS provider will attempt to negotiate a value for each of the options specified in the request. When the flags are LMI_DEFAULT, the LMS provider will return the default values of the specified options, or the default values of all options known to the LMS provider if no options were specified. When the flags are LMI_CURRENT, the LMS provider will return the current values of the specified options, or all options. When the flags are LMI_CHECK, the LMS provider will attempt to negotiate a value for each of the options specified in the request and return the resulg of the negotiation, but will not affect the current value of the option. The event reporting service primitives allow the LMS provider to indicate asynchronous errors, events and statistics collection to the LMS user. These service primitives implement the event reporting service (see Event Reporting Service). This LMS provider originated service primitive is issued by the LMS provider when it detects and asynchronous error event. The service primitive is applicable to all styles of PPA. Indicates the service primitive type. Always LMI_ERROR_IND. This LMS provider originated primitive is issued by the LMS provider to indicate a periodic statistics collection event. The service primitive is applicable to all styles of PPA. Following this structure within the M_PROTO message block is the provider-specific statistics. Indicates the service primitive type. Always LMI_STATS_IND. Indicates the statistics collection interval to which the statistics apply. This interval is specified in milliseconds. Indicates the UNIX time (from epoch) at which statistics were collected. The timestamp is given in milliseconds from epoch. This service primitive may be issued by the LMS provider in any state in which a local acknowledgement is not pending. This LMS provider originated primitive is issued by the LMS provider to indicate an asynchronous event. The service primitive is applicable to all styles of PPA. Following this structure within the M_PROTO message block is the provider-specific event information. Indicates the service primitive type. Always LMI_EVENT_IND. Indicates the provider-specific object identifier that identifies the managed object to which the event is associated. Indicates the UNIX time from epoch (in milliseconds). Indicates the provider-specific severity of the event. This service primitive can be issued by the LMS provider in any state where a local acknowledgement is not pending. Normally the LMS provider must be in the LMI_ENABLED state for event reporting to occur. Protocol service primitives implement the Signalling Data Link Interface protocol. 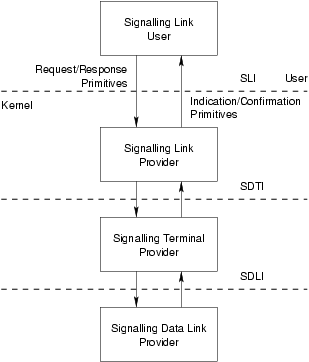 Protocol service primitives provide the SDLS user with the ability to connect transmission or reception directions of the bit stream, pass bits for transmission and accept recevied bits. These service primitives implement the protocol services (see Protocol Services). The connection service primitives permit the SDLS user to establish a connection between the line (circuit or channel) and the SDLS user in the transmit, receive, or both, directions. These service primitives implement the connection service (see Connection Service). This SDLS user originated service primitive allows the SDLS user to connect the user stream to the medium in the transmit, receive, or both, directions. Specifies the service primitive type. Always SDL_CONNECT_REQ. Specifies that the SDLS user stream is to be connected to the medium in the receive direction. Specifies that the SDLS user stream is to be connected to the medium in the transmit direction. This service primitive is only valid in the LMI_ENABLED state. Successful: Upon success, the connection request service primitive is not acknowledged. Unsuccessful (non-fatal errors): Upon failure, the SDLS provider indicates a non-fatal error with a LMI_ERROR_ACK message containing the error. The data transfer service primitives permit the SDLS user to pass bits for transmission to the SDLS provider and accept received bits from the SDLS provider. These service primitives implement the data transfer service (see Data Transfer Service). This SDLS user originated primitive allows the SDLS user to specify bits for transmission on the medium. Specifies the service primitive type. Always SDL_BITS_FOR_TRANSMISSION_REQ. This primitive is only valid in the LMI_ENABLED state. This SDLS provider originated primitive is issued by the SDLS provider to indicate bits that were received on the medium. Indicates the service primitive type. Always SDL_RECEIVED_BITS_IND. This primitive is only issued by the SDLS provider in the LMI_ENABLED state. The disconnection service primitives permit the SDLS user to disconnect the stream from the line (circuit or channel) for the transmit, receive, or both, directions. They also alow the SDLS provider to indicate that a disconnection has occured outside of SDLS user control. These service primitives implement the disconnection service (see Disconnection Service). This SDLS user originated service primitive allow the SDLS user to disconnect the SDLS user stream from the bit-stream in the transmit, receive, or both, directions. Specifies the service primitive type. Always SDL_DISCONNECT_REQ. Specifies that the SDLS user stream is to be disconnected from the medium in the receive direction. Specifies that the SDLS user stream is to be disconnected from the medium in the transmit direction. This SDLS provider originated primitive is issued by the SDLS provider if an autonomous event results in the disconnection of the transmit and receive bit-streams from the SDLS user without an explicit SDLS user request. Two error handling facilities should be provided to the SDLS user: one to handle non-fatal errors, and the other to handle fatal errors. These are errors that do not change the state of the SDLS interface as seen by the SDLS user and provide the user with the option of reissuing the SDL primitive with the corrected options specification. The non-fatal error handling is provided only to those primitives that require acknowledgements, and uses the LMI_ERROR_ACK to report these errors. These errors retain the state of the SDLS interface the same as it was before the SDL provider received the primitive that was in error. Syntax errors and rule violations are reported via the non-fatal error handling facility. These errors are issued by the SDL provider when it detects errors that are not correctable by the SDL user, or if it is unable to report a correctible error to the SDLS user. Fatal errors are indicated via the STREAMS message type M_ERROR with the UNIX system error [EPROTO]. The M_ERROR STREAMS message type will result in the failure of all the UNIX system calls on the stream. The SDLS user can recover from a fatal error by having all the processes close the files associated with the stream, and then reopening them for processing. *  Used by the SDT to send bits to the SDL. *  to the line might require some switching or other mecahnism. *  Used by the SDT to request that it be disconnected from the line. *  Used by the SDL to send received bits to the SDT. This License applies to any manual or other work that contains a notice placed by the copyright holder saying it can be distributed under the terms of this License. The “Document”, below, refers to any such manual or work. Any member of the public is a licensee, and is addressed as “you”. A “Secondary Section” is a named appendix or a front-matter section of the Document that deals exclusively with the relationship of the publishers or authors of the Document to the Document's overall subject (or to related matters) and contains nothing that could fall directly within that overall subject. (For example, if the Document is in part a textbook of mathematics, a Secondary Section may not explain any mathematics.) The relationship could be a matter of historical connection with the subject or with related matters, or of legal, commercial, philosophical, ethical or political position regarding them. The “Invariant Sections” are certain Secondary Sections whose titles are designated, as being those of Invariant Sections, in the notice that says that the Document is released under this License. The “Cover Texts” are certain short passages of text that are listed, as Front-Cover Texts or Back-Cover Texts, in the notice that says that the Document is released under this License. A “Transparent” copy of the Document means a machine-readable copy, represented in a format whose specification is available to the general public, whose contents can be viewed and edited directly and straightforwardly with generic text editors or (for images composed of pixels) generic paint programs or (for drawings) some widely available drawing editor, and that is suitable for input to text formatters or for automatic translation to a variety of formats suitable for input to text formatters. A copy made in an otherwise Transparent file format whose markup has been designed to thwart or discourage subsequent modification by readers is not Transparent. A copy that is not “Transparent” is called “Opaque”. Preserve the section entitled “History”, and its title, and add to it an item stating at least the title, year, new authors, and publisher of the Modified Version as given on the Title Page. If there is no section entitled “History” in the Document, create one stating the title, year, authors, and publisher of the Document as given on its Title Page, then add an item describing the Modified Version as stated in the previous sentence. In any section entitled “Acknowledgments” or “Dedications”, preserve the section's title, and preserve in the section all the substance and tone of each of the contributor acknowledgments and/or dedications given therein. Do not retitle any existing section as “Endorsements” or to conflict in title with any Invariant Section. A compilation of the Document or its derivatives with other separate and independent documents or works, in or on a volume of a storage or distribution medium, does not as a whole count as a Modified Version of the Document, provided no compilation copyright is claimed for the compilation. Such a compilation is called an “aggregate”, and this License does not apply to the other self-contained works thus compiled with the Document, on account of their being thus compiled, if they are not themselves derivative works of the Document. If you have no Invariant Sections, write “with no Invariant Sections” instead of saying which ones are invariant. If you have no Front-Cover Texts, write “no Front-Cover Texts” instead of “Front-Cover Texts being list”; likewise for Back-Cover Texts. ITU-T Recommendation Q.700, Introduction to CCITT Signalling System No. 7 , March 1993, (Geneva), ITU, ITU-T Telecommunication Standardization Sector of ITU, (Previously “CCITT Recommendation”). ITU-T Recommendation Q.701, Functional Description of the Message Transfer Part (MTP) of Signalling System No. 7 , March 1993, (Geneva), ITU, ITU-T Telecommunication Standardization Sector of ITU, (Previously “CCITT Recommendation”). ITU-T Recommendation Q.702, Signalling System No. 7—Signalling Data Link , March 1993, (Geneva), ITU, ITU-T Telecommunication Standardization Sector of ITU, (Previously “CCITT Recommendation”). ITU-T Recommendation Q.703, Signalling System No. 7—Signalling Link , March 1993, (Geneva), ITU, ITU-T Telecommunication Standardization Sector of ITU, (Previously “CCITT Recommendation”). ITU-T Recommendation Q.704, Message Transfer Part—Signalling Network Functions and Messages , March 1993, (Geneva), ITU, ITU-T Telecommunication Standardization Sector of ITU, (Previously “CCITT Recommendation”). Geoffrey Gerrietts; Dave Grothe, Mikel Matthews, Dave Healy, CDI—Application Program Interface Guide , March 1999, (Savoy, IL), GCOM, Inc.
 ITU-T Recommendation Q.771, Signalling System No. 7—Functional Description of Transaction Capabilities , March 1993, (Geneva), ITU, ITU-T Telecommunication Standardization Sector of ITU, (Previously “CCITT Recommendation”).